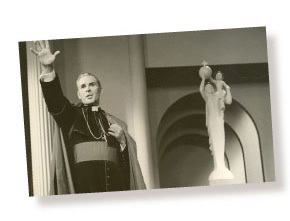 If you believe the world is in need of a saint like Fulton Sheen, please join us in our mission. With your help we can use Sheen’s example to inspire others to a deeper relationship with Christ and His Church. Hosting a screening or encouraging a leader in your parish, diocese or organization to host a screening by clicking on this link. Offering your prayerful and financial support that our mission will be made possible. Your generous support helps us with the work of the postulator in Rome, our efforts to share the life and teachings of Bishop Sheen with a new generation, and the daily operations of the Foundation office in Peoria, Illinois.